RANCHO PENASQUITOS (KGTV) - Teens playing basketball in Rancho Penasquitos said they were robbed Saturday night. Police said during the pursuit of a car that matched the description, it crashed and rolled onto the roof. One suspect was injured from the crash as he was not wearing a seatbelt. He was trapped in the car and arrested. Police say two other suspects, identified as a black man in his 20s and a Hispanic man in his early 20s fled the vehicle. K9s searched the area for the suspects. Ed Solis, the father of one of the boys who was robbed, said it was his son's 18th birthday and they were celebrating at home. Toward the end of the party, the guys wanted to play basketball at Views West Park. They left their belongings in a pile and noticed a group of men stealing their wallets and phones. The teens went after the attempted robbers and were able to catch one. Solis said one of the men came back and threatened the boys, saying he had a gun and would "smoke them." The boys let the man go and then called Solis about the robbery. He rushed over, and found all the boys were safe and unharmed, but shaken. 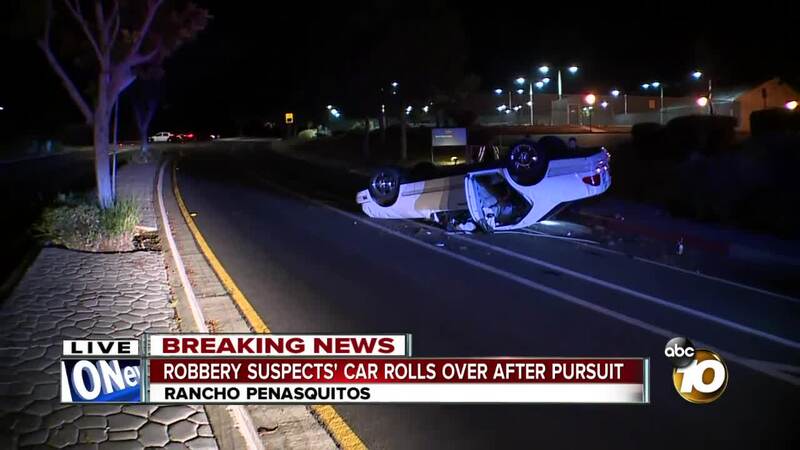 Officers caught up with the suspect vehicle at 14500 Penasquitos Drive where it flipped. Some of the boys got their items back, while others did not.